Updated 2017 • Instant digital download • High quality printable PDF • Formatted in letterhead size (8.5″ x 11″) • 77 pages • Non-commercial license • For personal use only • No physical product will be shipped! 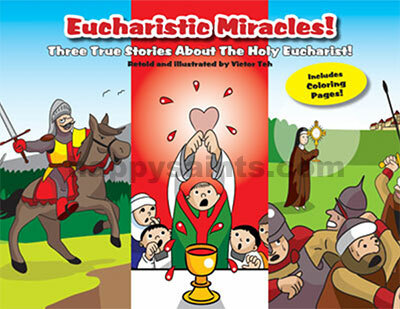 The 'True Tales of the Eucharist' ebook retells famous Eucharistic Miracles in full color illustrations that children and everyone else will enjoy and be inspired by the Real Presence of Jesus in the Eucharist! Includes 3 stories: 'Bread Turn Flesh', 'The Invaders' and 'The Proud Knight', featuring respectively the Eucharistic Miracles of Lanciano, St. Clare of Assisi and Seefeld in Austria. Includes coloring pages. "Bread Turned Flesh!" is a delightful retelling of the Eucharistic Miracle of Lanciano, Italy. In the year 730AD, a priest had doubts about the Real Presence of Jesus in the Eucharist. He questioned how bread and wine could turn into the Flesh and Blood of Jesus during Mass. God decided to give him a surprise! Illustrated in full color. Ideal for ages 4 to 9. "The Invaders!" is an exciting retelling of the Eucharistic Miracle of St. Clare, which happened in Assisi, Italy. When invaders came to attack Assisi and St. Clare’s monastery in the year 1240AD, all seemed lost. 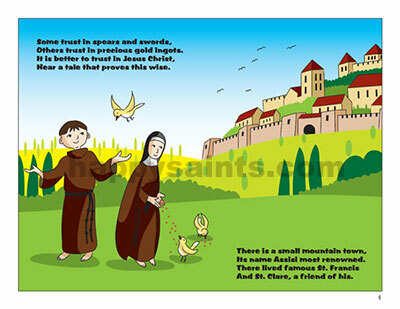 Yet St. Clare and her nuns had faith in Jesus in the Eucharist, and then an amazing miracle happened! Illustrated in full color. Ideal for ages 4 to 9. “The Proud Knight” is a humorous retelling of the Eucharistic Miracle of Seefeld, Austria. Oswald Milser was a victorious but arrogant knight. 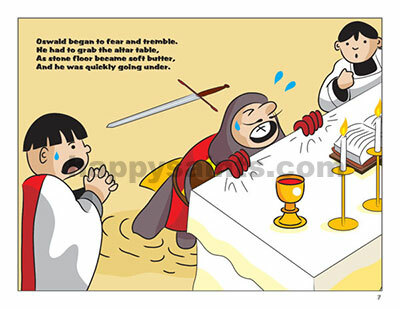 During Holy Mass, he decided that he deserved the best and forced the priest to give him the largest Eucharistic Host. God decided to show him that Jesus was greater! Illustrated in full color. Ideal for ages 4 to 9.
eBook comes in a single PDF file for convenience! 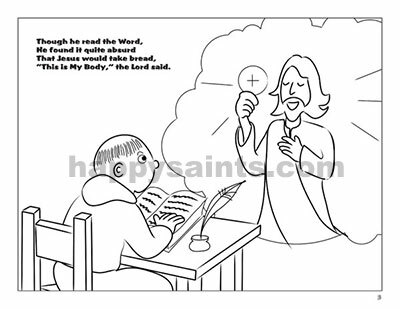 Printable PDF version of books, including black and white coloring pages. The ebook comes in a single PDF file which includes all 3 stories. The file is formatted for US Letterhead size and may be printed for non-commercial use with any home printer. Instant download after check-out.